A lot changed with the Trump tax plan approved at the end of last year, and many individuals and businesses are scrambling to figure out how it’s all going to affect them. One of the provisions in the new tax plan requires U.S. businesses with foreign holdings to pay taxes on their assets overseas. Section 965 applies to untaxed foreign earnings after 1986, and it taxes cash or cash equivalents at 15.5 percent and all other earnings at 8 percent. This is the so-called “transition tax” on foreign earnings that was passed under the Tax Cuts and Jobs Act. Businesses have the option to pay these taxes over an eight-year period if they need. The notice also discusses how adjustments can be made to reflect things like distributions among foreign corporations, previously taxed income, ownership among U.S. shareholders, and more. Parts of the notice provide clarification for previous guidelines that were issued, and parts of the notice introduce new guidelines. Some items in the notice make modifications to prior guidelines issued, so it’s possible that future modifications will be made. For example, the notice modifies the old guideline to determine earnings subject to the transition tax in part through Nov. 2, 2017 and allows taxpayers to use month-end dates instead. The notice does let taxpayers know that additional guidelines will be issued on the transition tax, but in the meantime, it instructs taxpayers to rely on the guidelines that are currently available. The next notice will be published at the beginning of February. The IRS has requested feedback on what information should be included in the next notice, including what guidelines or clarifications need to be introduced. Notice 2018-13 is 31 pages and provides extensive information regarding the requirements under the Tax Cuts and Jobs Act. There are so many issues involved in reporting taxes on foreign assets and profits, so these regulations are quite complex. There may be many more notices tweaking the guidelines for these new requirements. It can be difficult to understand all the guidelines on their own, let alone to keep up with all the changes. It is essential that businesses with foreign interests work with an experienced tax law attorney who can help them understand their new obligations and who can keep them updated as the guidelines change. If you are a shareholder in a U.S. company with foreign interests, you may also need to consult with a Phoenix tax lawyer to understand your obligations under the new rules. Working with a tax law attorney near Phoenix can help you make sense of the transition tax and other changes under the Trump tax plan, and it can help you formulate your thoughts to submit to the IRS on the evolution of these new guidelines. The agency continues to make modifications based on feedback. However, it should be understood that modifications are made to make the new law more clear, not to change the responsibilities that taxpayers have to the government. 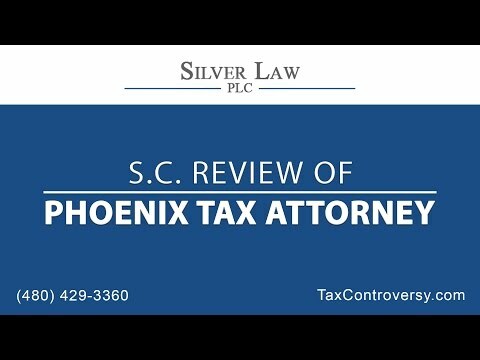 While these guidelines may be new to everyone, including your accountant and tax lawyer, interpreting changing guidelines and knowing how to navigate the complex seas of politics and the tax code are nothing new to the experienced team at Silver Law PLC in Arizona. Every PHX tax law attorney on our team has worked for the IRS, which gives them a unique understanding of how the IRS operates against taxpayers when changes to the tax code are made. They use their experience to help protect you from penalties. If you have a stake in a business that has some of its operations overseas, contact our Arizona firm to talk with a tax lawyer near Phoenix about how these changes will affect your tax obligation. Our attorneys will also help you understand how other recent changes to the tax code may affect you. What Changes in Tax Law Might We See Under President Trump?